Ozawa-no-Gyōbu Tomofusa, who served under Yasuda-no-Shōji Tomoharu in Shinano Province, learned in Kyoto of the death of his master. Tomoharu had an argument with his peer (cousin), Mochizuki Akinaga, and was killed by him. Tomofusa also overheard that someone working for Mochizuki is trying to kill him, too. To protect himself, he has come to a lodging town in Moriyama, where he is passing his days as the keeper of an inn called Kabutoya. Yasuda-no-Shōji Tomoharu’s wife and his son, Hanawaka, escaped from their homeland and have been aimlessly travelling around the provinces. One day they arrive at Moriyama and happen to stay at the Kabutoya Inn. 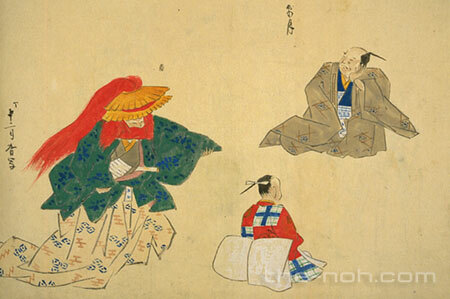 Tomofusa, aware that they are the wife and son of his bereaved master, reveals his identity to them, and they together rejoice the moment of their reunion. Just then, Mochizuki Akinaga and his entourage, who have finished their business in Kyoto and are on their way back home, arrive in the town of Moriyama and decide to stay at the Kabutoya Inn. Tomofusa is surprised that his foe, Mochizuki, has come to his inn and is convinced that the heavens have given him this chance to avenge his master. Tomofusa informs the wife and son about their foe’s presence, and they together plot their revenge. He disguises Tomoharu’s wife as a blind entertainer and sends her and her son to the party in Mochizuki’s room. He himself brings alcohol to Mochizuki’s room and waits at the party for his opportunity to approach Mochizuki. Tomoharu’s wife sings while her son dances with a kakko (a small tabor drum). Tomofusa performs a lion dance. They entertain Mochizuki, let him get drunk, and do their best to have him drop his guard. When the drunk Mochizuki becomes drowsy, Tomofusa, together with Hanawaka, attacks and slashes him. They finally attain vengeance against their foe. “Mochizuki” is a revenge story, such as the tales of the Soga brothers (including “Youchi Soga” and “Kosode Soga”) and “Hōkazō.” The protagonist is Ozawa-no-Gyōbu Tomofusa, but the title of this piece, “Mochizuki,” is the name of the foe who killed Tomofusa’s master. In this story of retribution, Tomofusa is reunited with the wife and son of his slain master, and they together avenge him at the Kabutoya Inn that Tomofusa owns. This is a didactic story, emphasizing the bond between master and subordinate. 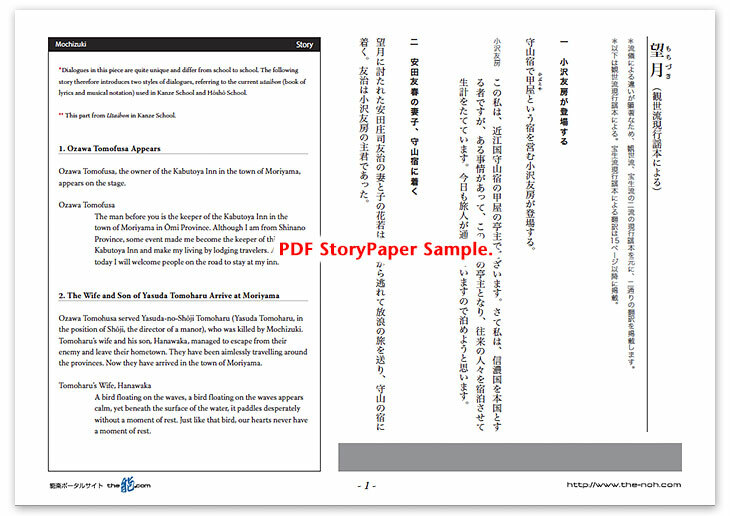 This play is also classified as geitsukushi-mono (a piece with a number of dance performances). To make Mochizuki relax, the wife and son, disguised as entertainers, sing and dance for him. The lead character, Tomofusa, also performs a secret dance, that of “the lion,” showing his great skill. The dances and songs subtly build tension and excitement for the audience. The white-knuckle scenes propel the audience toward the climax of vengeance. The combination of entertaining scenes, dances, and music makes every part of this drama thoroughly enjoyable. This piece is as entertaining as a swashbuckler, with action that is very different from mugen-noh describing dreams or illusions. Here we see the diversity of expression in the world of Noh.